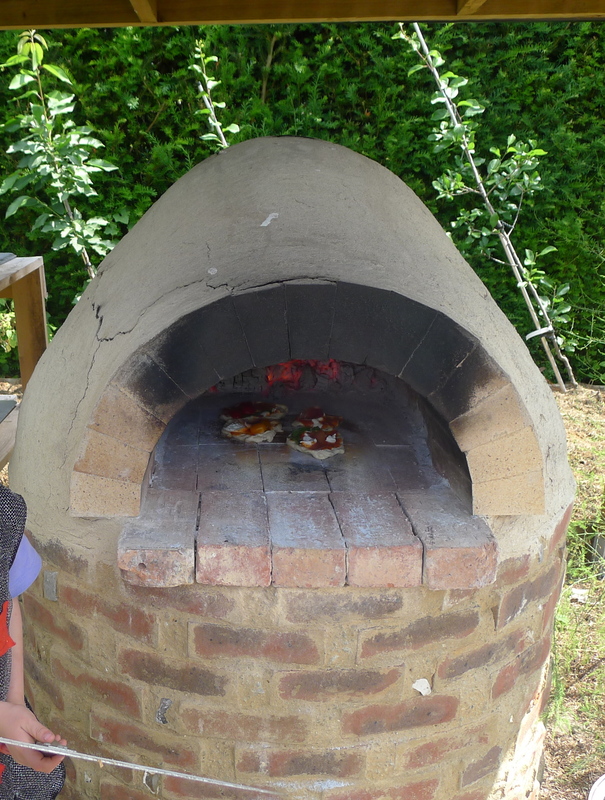 There are many fine pizza recipes out there, but this is our version for the clay oven. The dough recipe is from Tamasin Day-Lewis’s “Supper For a Song”, and is very good, as are so many of her recipes. 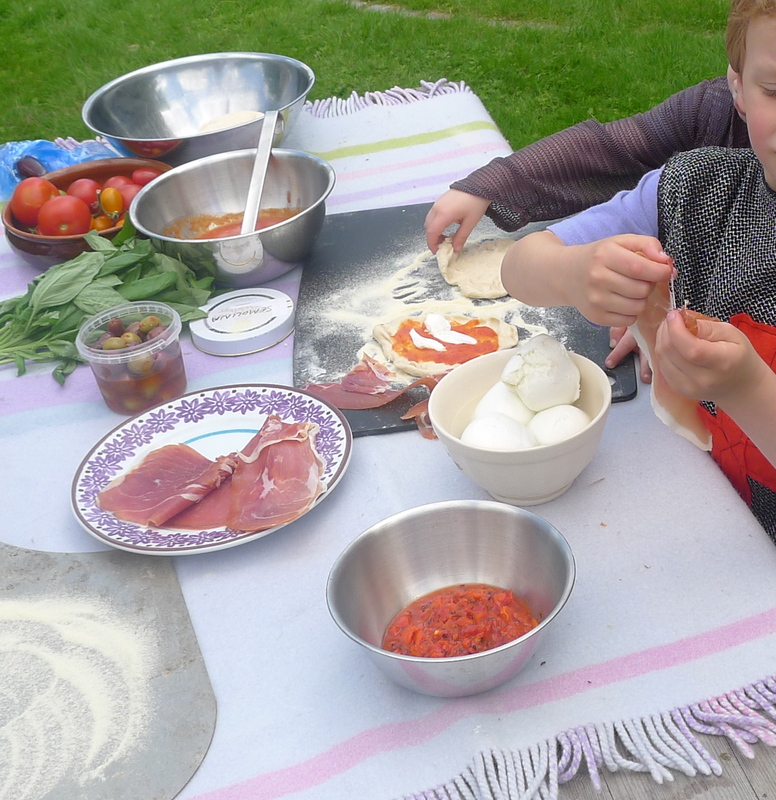 Tip out the dough onto a work-surface (or board if in the garden), and add the yeast and salt. Make a well in the middle and pour in the olive oil and about 2/3rds of the water. Start to form your dough by bringing the inside wall of flour into the middle and mixing it into the liquid with your fingers. Keep mixing, drawing in more flour as you go. When it gets difficult, add more water. Keep going like this until you have a dough – you’ll know you’re at the right point when your hands start to get cleaner again, not stickier. 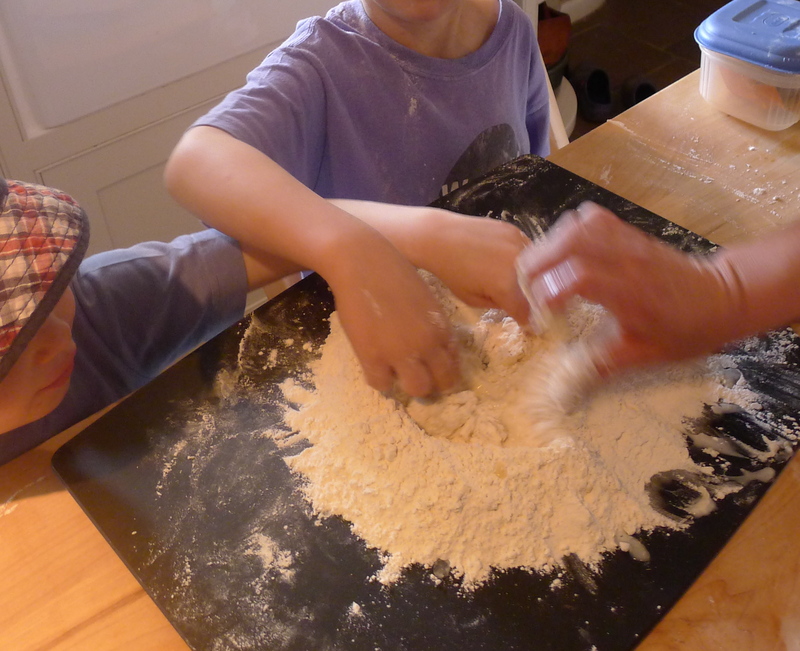 Put the dough on a lightly floured surface and knead for several minutes, stretching it then bringing it back onto itself (or as I tell my six year old, like a butterfly, open its wings, then bring them together). It’s ready when it feels springy and alive under your touch, and bounces back gently if you press your thumb into it. Divide into at least two, depending on how many pizzas you are making. (This makes two handsome ones, but we often make many smaller ones and let the boys “create” their own). Shape the pieces into balls, and put them on an oiled tray, covered with an oiled plastic bag, and leave them to rise until they have doubled in size. They need to be somewhere warm, and not in a draft. The green-house works for us, but we have to keep an eye on them there, as they will have done all the rising we want them to after 40 minutes in there, rather than the more typical one and a half hours. 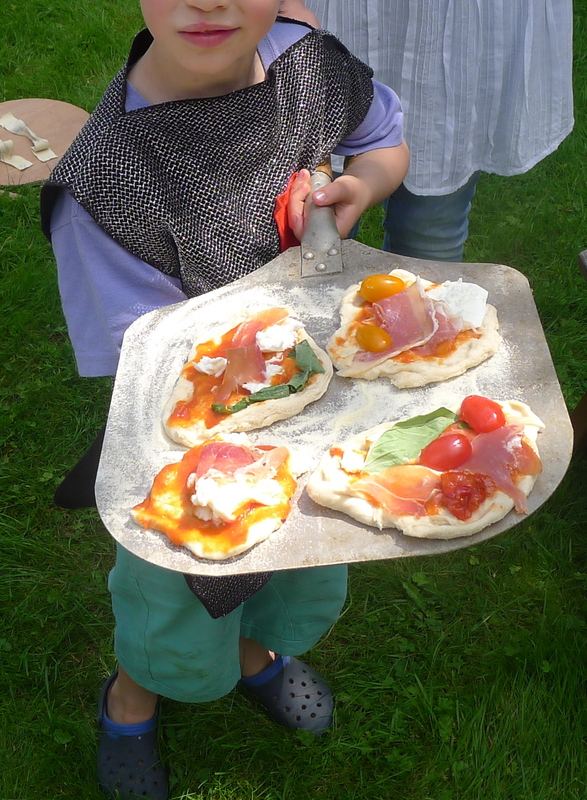 Scatter semolina onto a metal pizza peel (it is really worth getting one of these) and grab a ball of dough. Knock the air back out of it, and stretch it then roll it until it is very thin, 5mm / quarter of an inch or preferably less. Leave the edge a little thicker to hold the sauce. Now, working fairly quickly to avoid sogginess and sticking, ladle a little tomato sauce (any you like, homemade or from a jar – I found out recently, using up things from a Christmas hamper, that the Brindisa red-pepper and tomato sauce is really good for this, not authentic, but delicious). Then on with toppings. I like torn mozzarella, torn basil, and if I’m feeling luxurious, torn parma ham. (There’s no great insistence on tearing as opposed to cutting, but I’m usually in the garden in a hurry and running out of hands at this point, so tearing it is). Then toss a handful of semolina onto the floor of the oven, and slide the pizza onto it, off the peel. Wait a few moments, if you can hold out, for it to cool a little, and tuck in.